Many of our articles here are new items about men doing or being good, or Well as it were, but we also have the Heviews which review products and services for the Well-Met Man. But once you have stuff, you need to know how to use it, care for it, even dispose of it. That is where The Man Way column comes in. One of those things every man should have and know how to buy and use is a suit. Luckily, there is a great a guide on how to choose a suit, via information provided by House of Fraser, the leading, national premium department store group in the UK and Ireland with a strong social responsibility policy. Of all the possessions a man can own, perhaps none can give the impression of being a man more than a suit. A home may never be seen, you may or may not own a car, but with a proper suit you can instantly make a good impression. The important thing is that a suit need not be expensive, but by selecting it properly for fit you can ensure it makes you look far better than the investment. So how do you find and select a suit that will fit you and make you look more fit at the same time? Regardless of your budget, even getting on at a resale shop, if you follow some rules of fit you can make a suit look damn good. 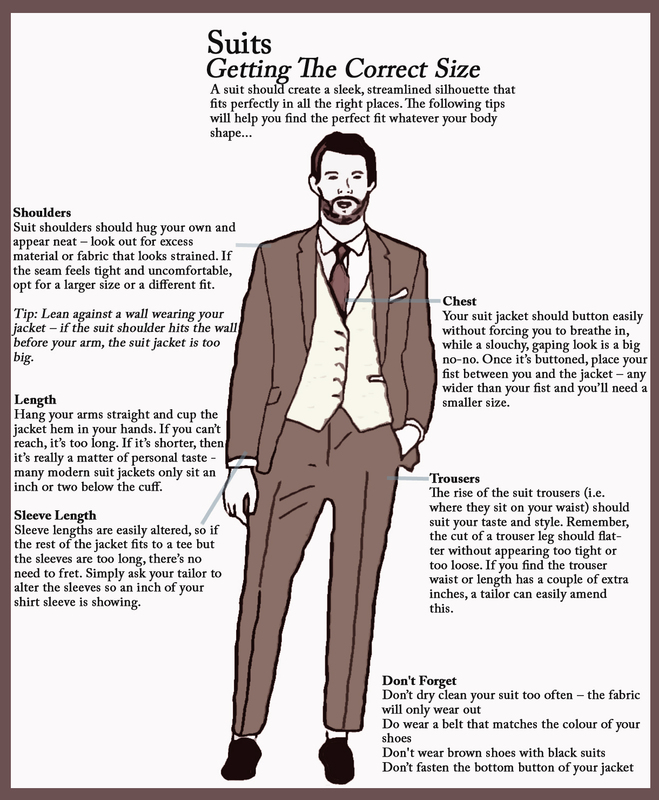 House of Fraser's complete guide can be found here, but they were kind enough to provide us with a special infographic on correct sizing of suits. The first thing is to know what you need the suit for. Is it for every day work? For a wedding or special occasion? The look may be different for each situation. This is where details such as fabric, lapel shape and size, buttons and other style elements are up to you to select what is your style. Refer to the House of Fraser page on what each detail brings to the table. ShouldersSuit shoulders should hug your own and appear neat – look out for excess material or fabric that looks strained. If the seam feels tight and uncomfortable, opt for a larger size or a different fit. Tip: Lean against a wall wearing your jacket – if the suit shoulder hits the wall before your arm, the suit jacket is too big. ChestYour suit jacket should button easily without forcing you to breathe in, while a slouchy, gaping look is a big no-no. Once it’s buttoned, place your fist between you and the jacket – any wider than your fist and you’ll need a smaller size. LengthHang your arms straight and cup the jacket hem in your hands. If you can’t reach, it’s too long. If it’s shorter, then it’s really a matter of personal taste - many modern suit jackets only sit an inch or two below the cuff. Sleeve LengthSleeve lengths are easily altered, so if the rest of the jacket fits to a tee but the sleeves are too long, there’s no need to fret. Simply ask your tailor to alter the sleeves so an inch of your shirt sleeve is showing. TrousersThe rise of the suit trousers (i.e. where they sit on your waist) should suit your taste and style. Remember, the cut of a trouser leg should flatter without appearing too tight or too loose. If you find the trouser waist or length has a couple of extra inches, a tailor can easily amend this. A man does not need a suit to be a Well-Met Man, but if they have one, and it fits properly, they can have that extra little thing will push them past others around them. And remember fit is more important than price. If your suit fits you and you got it for pennies on the dollar you will look far better than someone who spent a fortune on a suit if theirs doesn't fit well. If the suit isn't a perfect fit, you can always take it to a tailor to get it fitted - the investment of personal tailoring to even an inexpensive suit can make you look like a million.